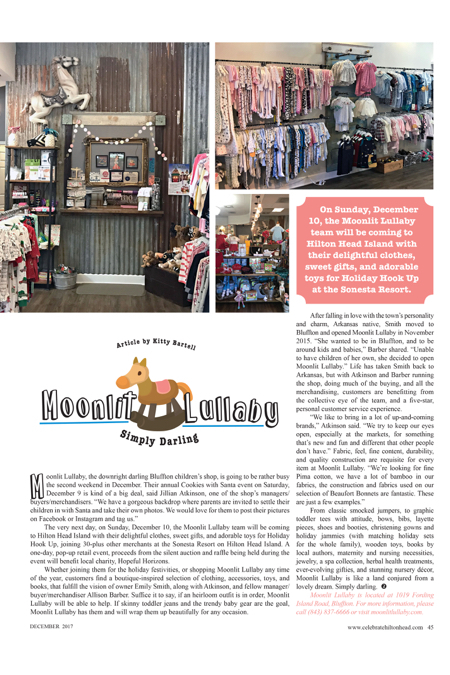 The very next day, on Sunday, December 10, the Moonlit Lullaby team will be coming to Hilton Head Island with their delightful clothes, sweet gifts, and adorable toys for Holiday Hook Up, joining 30-plus other merchants at the Sonesta Resort on Hilton Head Island. A one-day, pop-up retail event, proceeds from the silent auction and raffle being held during the event will benefit local charity, Hopeful Horizons. Whether joining them for the holiday festivities, or shopping Moonlit Lullaby any time of the year, customers find a boutique-inspired selection of clothing, accessories, toys, and books, that fulfill the vision of owner Emily Smith, along with Atkinson, and fellow manager/buyer/merchandiser Allison Barber. Suffice it to say, if an heirloom outfit is in order, Moonlit Lullaby will be able to help. If skinny toddler jeans and the trendy baby gear are the goal, Moonlit Lullaby has them and will wrap them up beautifully for any occasion. After falling in love with the town’s personality and charm, Arkansas native, Smith moved to Bluffton and opened Moonlit Lullaby in November 2015. “She wanted to be in Bluffton, and to be around kids and babies,” Barber shared. “Unable to have children of her own, she decided to open Moonlit Lullaby.” Life has taken Smith back to Arkansas, but with Atkinson and Barber running the shop, doing much of the buying, and all the merchandising, customers are benefitting from the collective eye of the team, and a five-star, personal customer service experience. From classic smocked jumpers, to graphic toddler tees with attitude, bows, bibs, layette pieces, shoes and booties, christening gowns and holiday jammies (with matching holiday sets for the whole family), wooden toys, books by local authors, maternity and nursing necessities, jewelry, a spa collection, herbal health treatments, ever-evolving gifties, and stunning nursery décor, Moonlit Lullaby is like a land conjured from a lovely dream. Simply darling. Moonlit Lullaby is located at 1019 Fording Island Road, Bluffton. For more information, please call (843) 837-6666 or visit moonlitlullaby.com.